This paper analyzes unemployment insurance (UI) schemes in the presence of mobile workers and trade unions at industry or country level that are capable of internalizing the effect of wage demands on UI contribution rates. We compare two types of existing UI systems. When UI is organized at trade union level (decentralized Ghent UI), trade unions strategically lower the benefit levels of their UI schemes to deter welfare recipients from other unions from entering their UI scheme, leading to a race to the bottom in UI provision. With centralized provision of UI, by contrast, trade unions do not fully account for the cost of higher wages as mobility allows them to partially shift the burden of unemployment to other UIs. 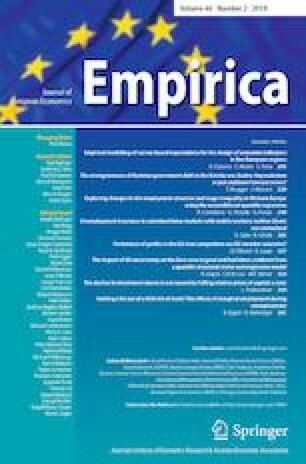 A system of coordinated UI, combining a centrally set benefit level with decentralized funding as in Ghent UI systems, can circumvent both the strategic benefit setting and the fiscal externality problems, thus reconciling the equity and efficiency aims in the design of unemployment insurance. We would like to thank Thomas Aronsson, Friedrich Heinemann and Marcel Thum and an anonymous referee for valuable comments and suggestions. The usual disclaimer applies. Under Centralized UI, full unemployment insurance cannot be provided at the labor-rents maximizing wage. which must equal zero in the case of N = 1 due to the equivalence of this case with the no-mobility Ghent union case, where wga satisfies the first-order condition (6).